Now available in a fully revised and updated fifth edition, Sport Management: Principles and Applications tells you everything you need to know about the contemporary sport industry. Covering both the professional and nonprofit sectors, and with more international material than any other introductory sport management textbook, it focuses on core management principles and their application in a sporting context, highlighting the unique challenges of a career in sport management. The fifth edition includes expanded coverage of sport for development, analytics, monitoring and evaluation, ethics, risk management, sport and health, social media, sustainability, and other contemporary management issues. Complemented by a companion website offering additional resources for students and instructors, this is an ideal textbook for first and second year students in sport management degree programs and for business students seeking an overview of applied sport management principles. Russell Hoye is Pro Vice-Chancellor (Research Development) at La Trobe University, Australia. He is the editor of the Sport Management Series published by Routledge, a member of the editorial board for Sport Management Review, International Journal of Sport Policy and Politics, and Journal of Global Sport Management; past President of the Sport Management Association of Australia and New Zealand (SMAANZ); and a graduate of the Australian Institute of Company Directors. Aaron C.T. 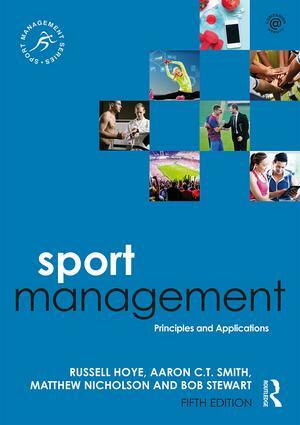 Smith is Professor of Sport Business in the Institute for Sport Business at Loughborough University, UK. Aaron has research interests in the management of psychological, organizational, and policy change in business and sport and health. Recently he has focused on the impact of commercial and global sport policy, the ways in which internal cultures shape organizational conduct, the role of social forces in managing change, and the management of social policy changes such as those associated with health and drug use. Matthew Nicholson is an Associate Professor and Director of the Centre for Sport and Social Impact at La Trobe University, Australia. His research interests focus on sport policy and development, the contribution of sport to social capital, and the relationship between sport and the media. Bob Stewart is a former Professor of Sport Studies at Victoria University, Australia. Bob has been teaching and researching the field of sport management and sport policy for 20 years, and has a special interest in cartel structures, social control, and player regulation in elite sports and the ways in which neoliberal ideologies shape sport’s governance and management practices.